The sum is part of a total of US$ 28,3 million in funds held by the companies Kildare and Durant, controlled by the Maluf family, which the Court has ordered repaid to the public coffers. Maluf has always denied controlling offshore accounts. The former mayor also denies embezzling money from public works during his administration. The first ruling of the Jersey court to recognize the city’s right to repatriate resources and rule against Maluf in a fraud case came in November 2012. In January of this year, the court calculated at US$ 28.3 million (more than R$ 55,8 million, as of April 11) the amount to be returned to the city. The sum is said to originate in the diversion of public funds during the construction of the Água Espraiada bridge (currently known as Roberto Marinho Avenue) 15 years ago, when current federal deputy Paulo Maluf (PP) was mayor of São Paulo. The city prosecutor told Globo that the sum will be repaid in two parts. In the week to come, the city will receive one million pounds sterling, or about R$ 3,3 million. The remaining sum will remain in Jersey for another week, at most, in order to pay legal costs. The amount recovered will be deposited in the accounts of the city administration and can be used by mayor Fernando Haddad (PT) as he sees fit, whether for debt payments or new projects. This is the first time the money embezzled by the Maluf family is returning to Brazil as the result of a lawsuit. For city prosecutor Celso Augusto Coccaro Filho, the outcome represents progress. “This was a necessary step and should be considered a victory for the municipal government,” he said. The companies convicted in Jersey have appealed to a court in England that judges appeals from British possessions, but this appeal did not lead to the suspension of the present case. O Globo tried to locate Maluf’s defense lawyer, without success. In rendering judgment, the Jersey court states that Maluf participated in a fraud against the Prefeitura during the construction of Avenida Jornalista Roberto Marinho, known at the time as Águas Espraiadas. 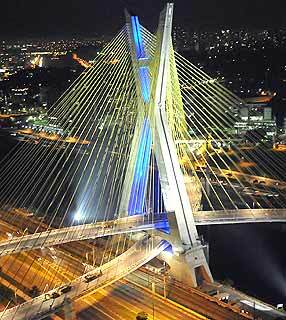 The renaming was an homage to the founder of the Rede Globo, an anchor tenant of the developments surrounding the new throughway — the bridge forms a backdrop to Globo news shows. The sentence was part of a civil suit filed in 2009 by the city government, with the assistance of a special prosecutor for cases involving public assets … The city prosecutor and the Public Ministry joined forces out of a common interest in the case. After Maluf left the city government, the embezzled funds were transferred, between January and February 1998, to accounts controlled by family members in the United States, according to a prosecutorial investigation. The court also found that Flávio Maluf, son of Paulo, knew of the fraudulent nature of the assets and engaged transactions with the money. According to the Jersey sentence, Flávio, at the instance or with the knowledge of his father, made 15 deposits, probably using black market doleiro currency traders, into a U.S. account in which his father was also a beneficiary. From this account, the money was transferred to the accounts of the two offshore companies.